A wine expert shares her tips for identifying your favorite flavor notes and pairing wine with summer meals. Is there anything better than ending a hot summer day with a crisp glass of wine? Whether you're whipping up dinner on the grill, a simple salad, or no-bake dessert, wine just makes warm-weather foods taste better. Because selecting the right wine for your palette can be a challenge, wine editor Sara Schneider from our sister brand Sunset shared her tips for enjoying wine in the summer months. Here, her suggestions for learning to identify your favorite flavor notes and pairing wine with summer meals. Plus, don't miss out on our new Health x Firstleaf wine club intro offer, which includes three bottles of wine curated by our editors. Unlike other subscription-based wine clubs, Firstleaf gives you the opportunity to customize each and every order. And because the wines are sourced directly from vineyards, you'll save up to 60% off retail. We'll toast to that! Is it true that seafood should always be paired with white wine? "It doesn't at all," Schneider says, explaining that this is a common misconception. "It's generally harder to go wrong with the likes of shrimp, crab, and scallops with white [wine], but it’s about how you season and cook the seafood, too." For example, if you're serving a salmon dish that's slathered with heavy Moroccan spices, Schneider would suggest a Pinot Noir. "And think about spicy, tomato-y seafood stew," she says. "A Sangiovese-based Chianti, with tangy acidity, bright red berry fruit, and earthy tomato-leaf notes, might be just the thing." What flavor notes in summer wines can an inexperienced palette most easily pick up on? Even if you're a less-experienced wine taster, you shoud be able to identify overt fruit flavors in your glass, says Schneider. (Think dark berries in Cabernet Sauvignon or apple in Chardonnay.) "It’s not even too much of a stretch for most people to home in even more than that on the fruit: Is it green, red, or golden apple?" she says. On the other hand, "it’s a little harder to pick up on everything that’s not fruit in a wine—espresso, herbs, or that tomato-leaf thing I just mentioned." How can inexperienced wine drinkers choose a bottle they’re likely to enjoy? Two things, says Schneider: "First, when you find yourself especially enjoying a wine you’re sipping, stop just long enough (short of bringing the conversation to a screeching halt) to think of a couple of words that seem true about it to you," she says. For example, ask yourself if the wine is crisp, or if it has a lot of aromatics (floral aromas). "Then, take those words to a wine shop," Schneider says. "Really, you’re way more likely to end up with a bottle you like if you find a good wine clerk and tell him or her what you’ve liked in the past than choosing by label charm in a supermarket wine aisle where there’s no help." How can you learn to pair wine with food? "Trust your instincts," says Schneider. "If you’re a foodie, flavors register deeply. And when you see and smell a dish, wine can actually pop to mind! You might think, red fruit would be the right foil here, and it needs to be a spicy wine because of what I’m smelling." The bottom line? "It’s a short path from novice to geek!" Ready to stock up on the best new summer wines? ORDER: For your first shipment, try our exclusive trial pack, which includes three bottles of wine selected by Health editors (sign up here to get started). RATE: Next, rate the wines you receive so Firstleaf can tailor each subsequent shipment to your unique taste (think Netflix or Pandora, but for wine). DECIDE: All Firstleaf shipments to follow will be customized to your taste preferences. Based on your feedback, you'll get recommendations for a personalized shipment of wines, but you can swap out individual bottles. You can also adjust your wine preferences, shipping frequency, and what day of the week you'd like your wine to arrive. SAVE: You save up to 60% off retail—$29.95 for this trial pack with an opt-in to the Firstleaf Wine Club, or $44.95 for a single purchase of this trial pack. Sign up for the Health x Firstleaf wine club here. 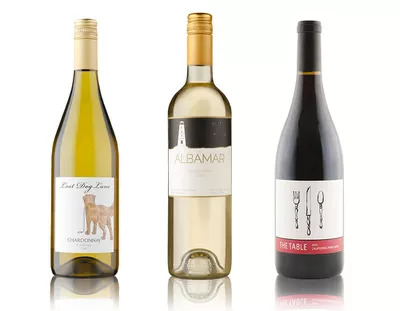 This month's exclusive intro offer includes three delicious summer wines: Lost Dog Lane 2014 Chardonnay California, Evening Land 2010 “The Table” Pinot Noir California, and Albamar 2015 Sauvignon Blanc Casablanca Valley Chile. Cheers! These tips from Sunset's wine editor Sara Schneider originally appeared on CoastalLiving.com.